The Ebro Delta is one the most vulnerable areas to climate change of Catalonia. Its coastal regression (caused by the reduction of the river sedimentary contribution as a consequence of the dam sediment retention within the Ebro watershed), the progressive sea level rise and the subsidence processes, compromise the sustainable development of this area of great environmental importance. In this context, the LIFE EBRO-ADMICLIM project propose a set of measures aimed to determine the present delta status, predict its environmental evolution and implement a set of adaptation and mitigation pilot actions to cope with climate change. 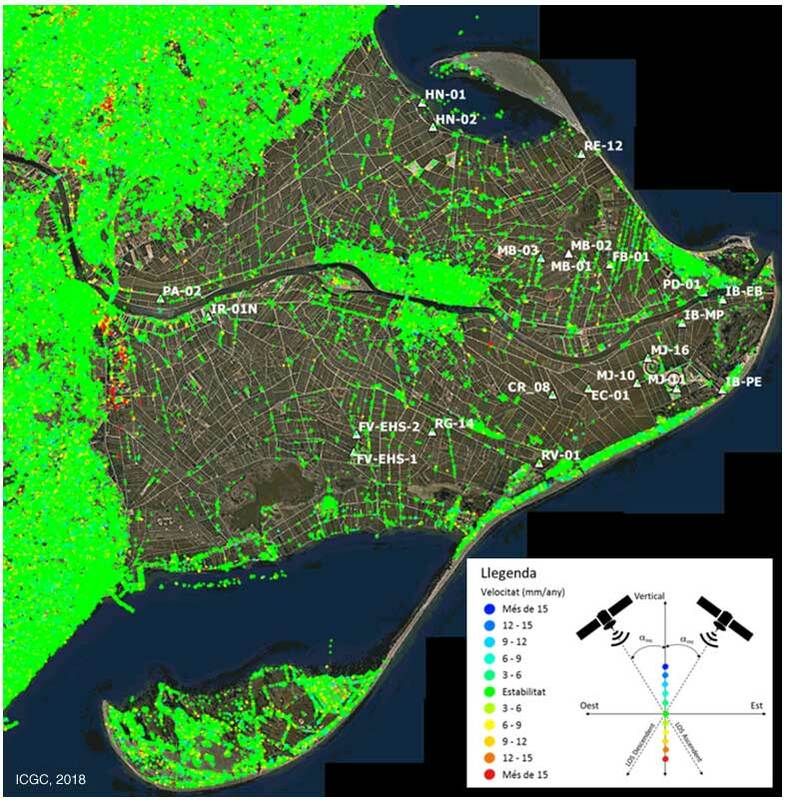 The ICGC participates in this project evaluating the recent historical subsidence distribution within the delta plain area. This task is developed considering the movements registered on the delta plain surface as well as the delta’s sedimentary structure. 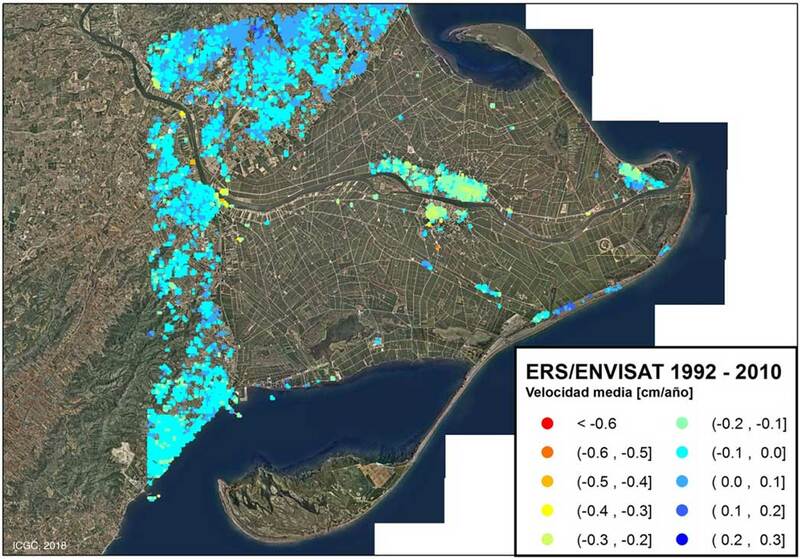 The results of processing and interpreting this data define a subsidence rate of the Ebro Delta plain between 1 and 3mm/year. All the details of the techniques used as well as the analyisis performed on the historical DInSAR data can be obtained on the report: Subsidencia Delta del Ebro, Estudio histórico 1992 – 2010 (PDF, 55 MB). In addition to ERS, ENVISAT and ALOS-PALSAR radar data, all the relevant data of the more recent Sentinel-1 satellite was downloaded and processed, from its launch until September 2017 (183 images). Despite its temporal limitation (roughly 2.5 years), its high orbital frequency (6-12 days) and resolution (~20 sq.m.) make Sentinel results compatible with the historical analysis. 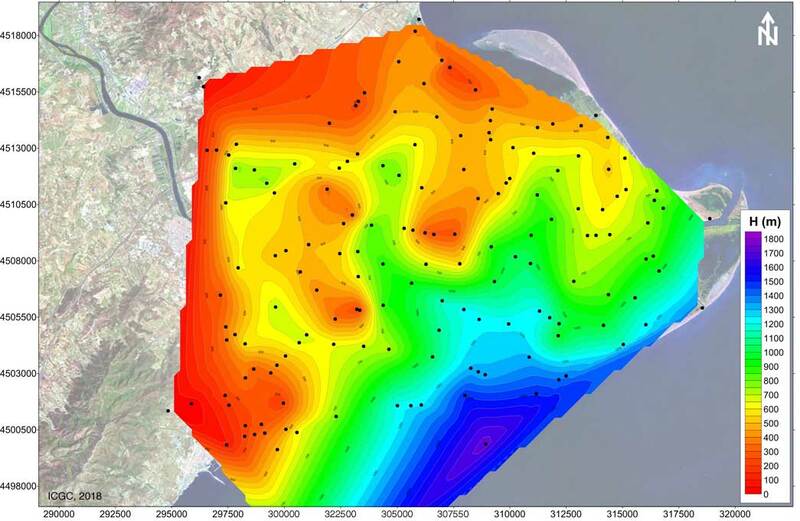 As Sentinel mission is planned to last several years, a set 22 of artificial SAR corner reflectors were installed on non-coherent spots distributed over the Ebro Delta, to improve its movement monitoring in the future. The Ebro delta’s sedimentary structure was defined trough different geophysical exploration techniques such as: Surface seismic waves, electrical resistivity tomography, H/V spectral technique, seismic array technique, magnetotelluric method, seismic refraction and reflection and well logging. These techniques combined with antique seismic reflection data reinterpretation allowed the identification of de sedimentary unit’s limits which characterize the delta and its basement. In addition the geophysical techniques used were essential to detect sedimentary layers prone to develop a higher subsidence rate due its composition (i.e. layers rich in organic matter). The obtained results and all the details of the used techniques are developed on the report: "Geophysical and Geological Studies for Subsidence Assessment of the Ebro Delta (PDF, 37 MB)". The historical and recent DInSAR data and the delta structure determined through the geophysical techniques were combined with geotechnical data into a zonation of the Ebro Delta plain subsidence and a 3D model of its sedimentary structure. The subsidence zonation was elaborated by considering the characteristics of the sedimentary deposits based on the geophysical and geotechnical characterizations within the delta context. The resulting zonation includes two types of information. Quantitative information was determined based on the active processes on de delta plain domain. Qualitative information was determined based on the sedimentary unit’s characteristics, the delta domains and the processes which affect the delta (such as sea erosion). Zonation results were validated through its comparison with all the DInSAR data available. 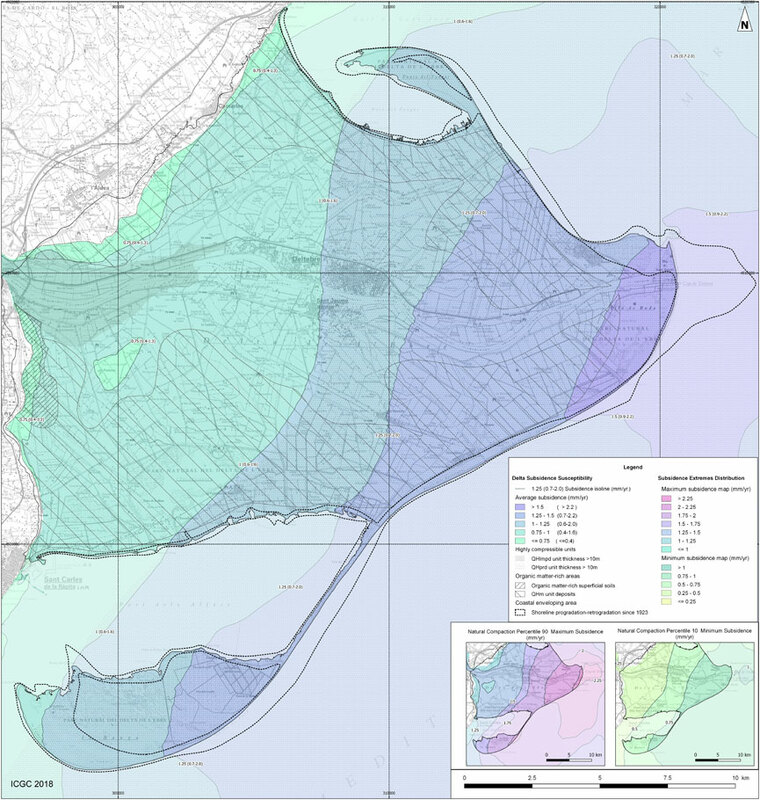 The details of how the different data sources were used, as well as the limitations of each methodology and the final zonation map can be consulted on the report: "Subsidence Susceptibility of the Ebro Delta Plain" (in process). The different visualizations of the Ebro delta plain 3D model as well as the information used for its generation and information regarding its limitations are available at the report: "3D Geological Model: Reconstruction of the Architecture of the Holocene Deposits of the Ebro Delta Plain" (in prep.). 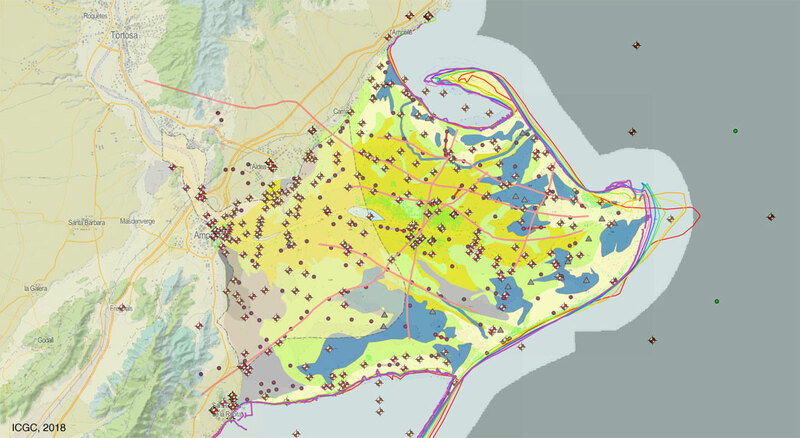 All the spatial information of EBRO DELTA-ADMICLIM project can be consulted on the project Life EBRO ADMICLIM Geoindex viewer. ICGC preformed two flooding simulations of The ebro delta plain during the 21st century using a set of parameters agreed with the project coordinator IRTA-Sant Carles de la Ràpita. 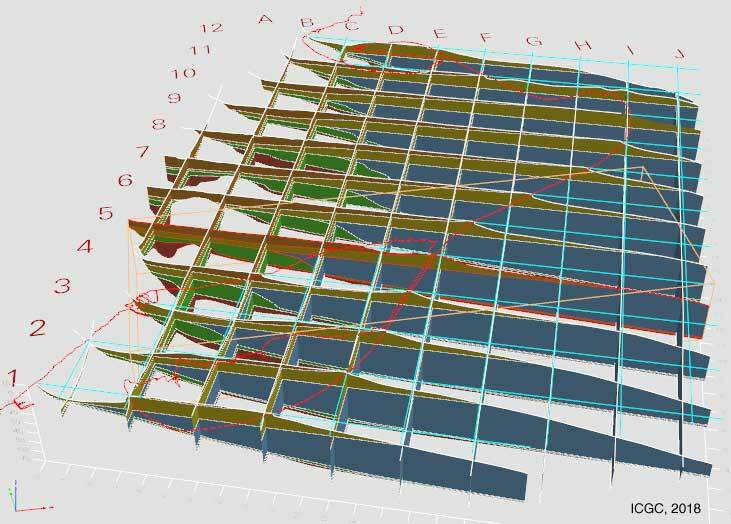 First simulation features the actual sedimentary contribution close to zero, while the second consider the sediment contribution proposed within the project. These simulations are preformed considering an annual sea level rise of ~6mm/year, equivalent to the RCP 4.5 IPCC scenario (conservative). The red areas mark domains under the actual sea level, which are not flooded as they are not connected to the sea. The sea level rise is accelerated by the effect of climate change, and is expected to increase from 0.5 to ~2 m until the end of the century. Flood simulation of the Ebro Delta based on subsidence velocity analysis, integrated with the IPCC estimate for a sea level rise of the RCP 4.5 (~ 6mm / year) scenario represented on the high resolution terrain elevation model of the ICGC. The red zones correspond to areas that are below sea level. The image on the left corresponds to a model that is based on the assumption that there is no sediment input; the image on the right represents the contribution proposed by IRTA in the framework of this study.